Enormously versatile and always in demand, Rogers’ collection of silicone materials has been specifically developed for use in a wide range of heat shielding and insulating applications. Silicone materials are well known as thermal and electrical insulators as well as useful for gasketing, cushioning, and sealing. We stock a variety of silicone products that can be used for a variety of applications. From ultra soft silicone foam, which allows designers to use less force to seal enclosures and still protect their device from the environment, to extra firm silicone that offers excellent memory and low stress relaxation, which reduces maintenance costs associated with gasket failures due to compression set and softening. 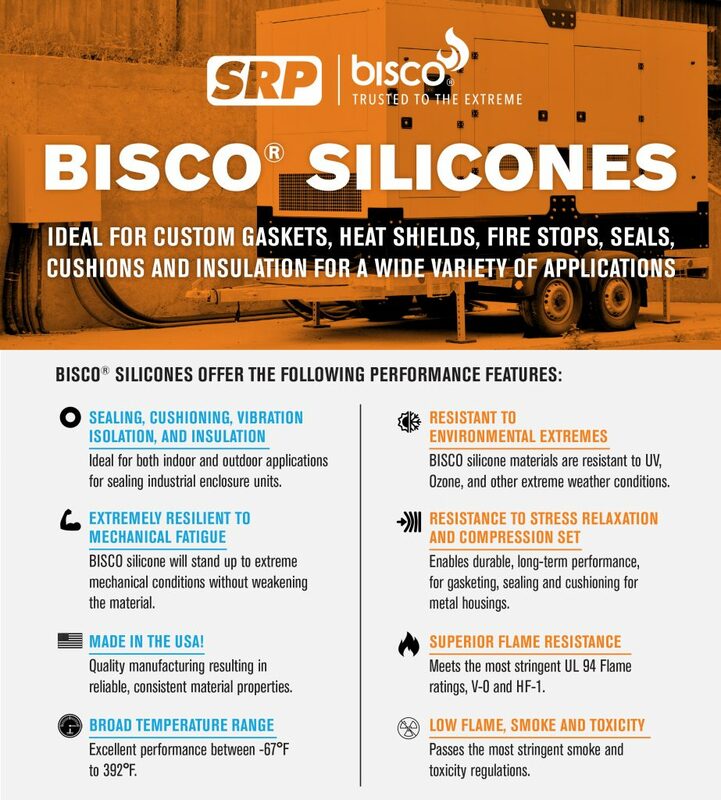 Our customers include companies involved in the automotive, safety and security, HVAC, and aerospace industries, as well as a number of other industries that require the dependability and exceptional performance BISCO products can bring. Competitively priced and formulated to comply with a range of national and international legislation, we offer a premium solution that can be easily adapted to your specific requirements. SRP is proud to be a Rogers Corporation Preferred Converter for their line of PORON® Polyurethane and BISCO® Silicone materials. We provide distribution and converting of these materials to various industries and customers around the world. Being a Preferred Converter for Rogers provides us access to all Rogers materials, with the added benefit of discounts and favorable lead times. SRP converts these materials in custom gaskets, seals, pads and stripping. All products can be laminated with a pressure sensitive adhesive.